Park City • He grasped the red, white and blue in his right hand, even as he looked on at arguably the greatest freeski halfpipe skier ever having just dropped into the pipe. 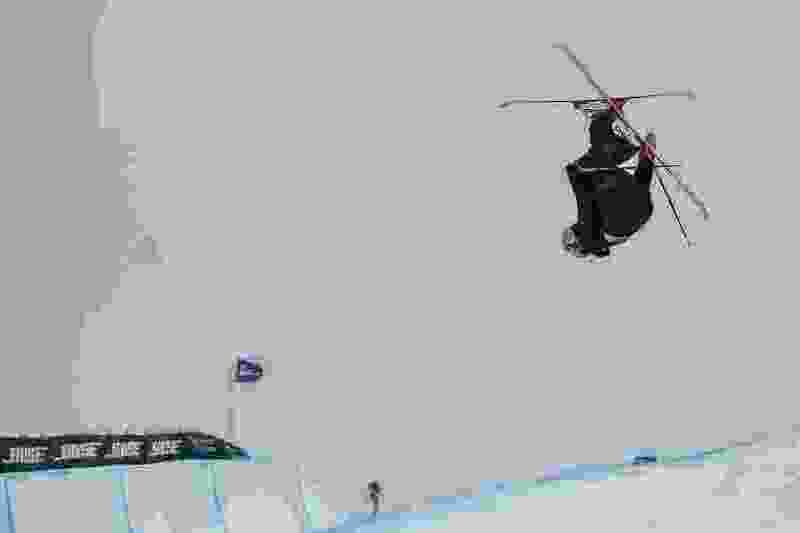 There was nowhere else to be but where Aaron Blunck found himself Saturday afternoon, in first place, another world championship so close, but at the same time so far away. Because when his friend and U.S. teammate David Wise, a two-time Olympic gold medalist, veered into the Eagle Superpipe as the last competitor, Blunck knew what could happen. Wise, so often, saves the very best for the very last. He did so at last year’s 2018 Olympic Winter Games in Pyeongchang, South Korea, after two wobbly runs, Wise’s third resulted in his second Olympic gold. So there stood Blunck, the 22-year-old defending FIS world champ, an American flag already in hand, ready to see what Wise could conjure up. It was an uncharacteristic rough day for Wise, turns out. Wise didn’t spur magic. Instead, it was another massive step in a burgeoning young career for Blunck, who eventually dropped the flag across his shoulders in celebration. The American freeskier from Crested Butte, Colo., capitalized on his own third and final run, putting down the best run of the day, earning a 94.20 to top the rest of the 10-man final in Saturday’s FIS World Championship free ski halfpipe final. Blunck, a two-time Olympian, now has two world championship golds and is seeing his career ascend higher even against a field as star-studded as this era of freeski halfpipe remains. For some context: two weeks ago at the Winter X Games, Blunck finished seventh overall. Two weeks later, he’s got another world title to his name and after being handed another world championship gold, got to sing the National Anthem on the center spot of the podium. On that third and final run, Blunck threw down a new trick, a double-cork 1440, that he’s been perfecting throughout this season. He landed it first earlier this year at a U.S. Grand Prix event in Copper Mountain, Colo. That made all the difference in the end. 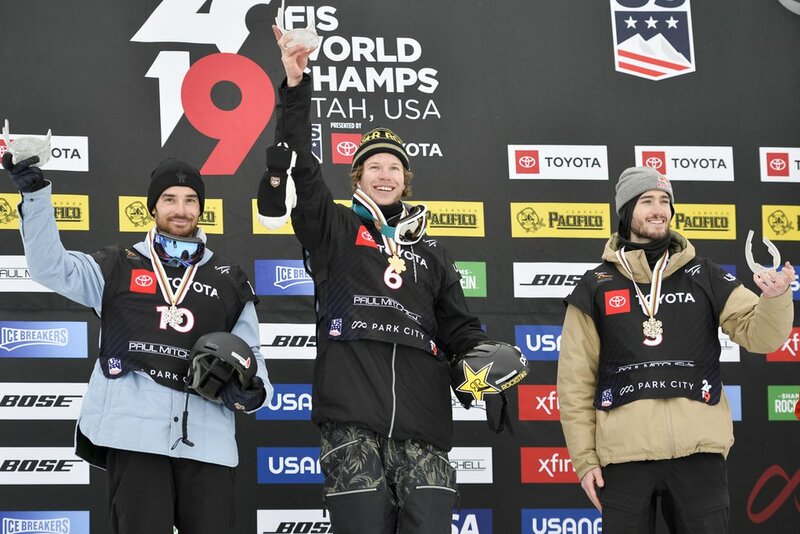 Blunck wasn’t the only American on the podium Saturday. U.S. freeskier Brita Sigourney earned a bronze medal in the women’s ski halfpipe final. The bronze medalist at last year’s 2018 Olympics, Sigourney earned her first world championship medal, finishing with a 90.60. Estonia’s Kelly Sildaru, just 16, won the gold with a 95.00, while last year’s Olympic gold medalist, Canada’s Cassie Sharpe, finished with the silver with a 94.40. Sigourney, 29, said she’s still eager to pursue new heights herself, even as the next generation like Sildaru are climbing higher and changing the sport each season. “I’m still having fun and I’m having fun progressing myself and pushing myself,” Sigourney said, “so whenever that stops, I’lld definitely retire, but for now, I’m just still enjoying it. I’m just riding this wave."